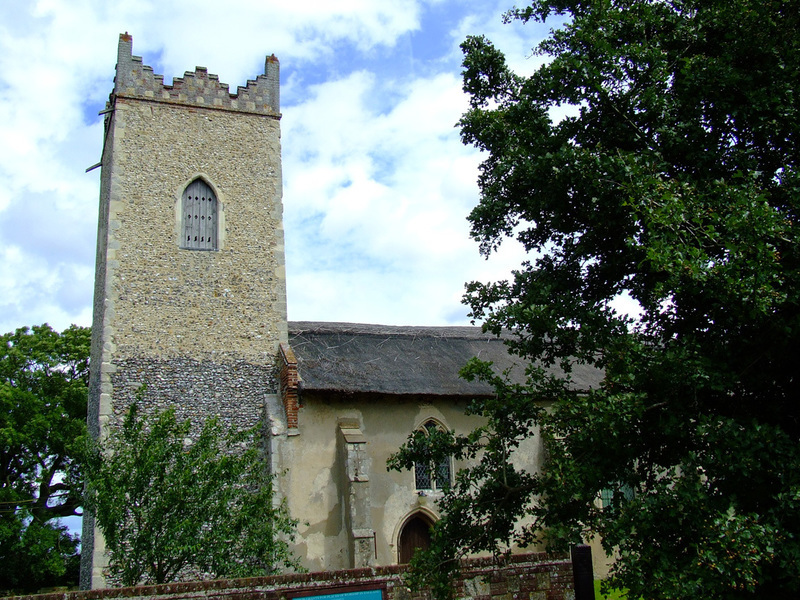 Notes on Medieval Flegg and Broadland, in Norfolk, East Anglia. Above image copyright of openstreetmap.org. Modified to show local districts of Broadland and Flegg. Flegg is a district of two hundreds, consisting of a total of 22 parishes, set in Broadland, in the east of the East Anglian county of Norfolk. It is thought that with the higher sea levels of the Roman period, that it would have effectively have formed an island bordered by reed beds, marshes, river valleys on the west and south, and the North Sea in the east. 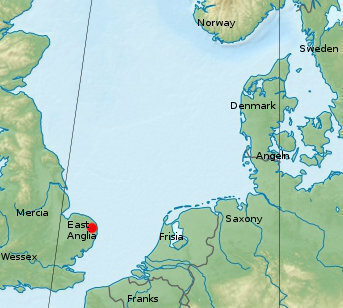 As sea levels decreased slightly during the Anglo-Saxon period, and drainage systems advanced, so Flegg became better connected to the "mainland". The name "Flegg" is Anglo-Danish in origin, as are many of it's parish names such as Ormesby, Rollesby, Hemsby, Stokesby, Filby, Scratby, Mautby, Thrigby, Billockby etc. No other district in East Anglia, a region that formed a part of the 10th Century Dane-Law has such a concentration of Scandinavian place-names. In this post I want to record some transcriptions taken from some studies in my book collection, that relate to Flegg, or to the wider area of Broadland (East Norfolk), during the earlier Medieval period. "But there are also districts of deep, extremely fertile and easily worked loams, especially on the former island of Flegg. The whole area is dissected by the wide lush valleys of the Wensum, Bure, Ant, and their tributaries. The medieval settlement pattern was dispersed, with common-edge hamlets and many isolated churches." 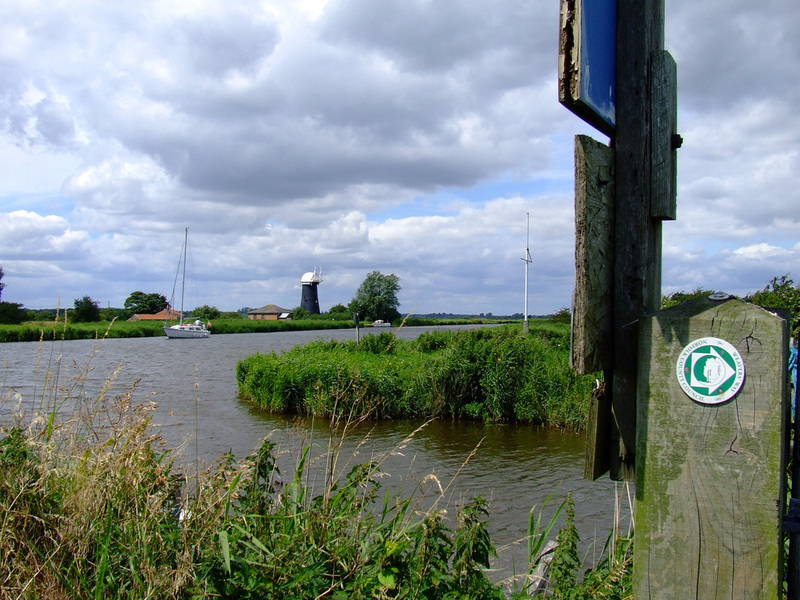 The Norfolk Broads - A landscape history. Tom Williamson. 1997. Manchester University Press ISBN 0 7190 4801. "The Broadland fens and marshes are nowhere so extensive that the traveller loses sight of the 'upland'. Even in the middle of the Halvergate marshes the higher ground can be seen, low on the horizon, often picked out by the lines of woodland growing on the relict 'cliffs' of the former estuary. Some of the higher land once comprised islands: Flegg covering some 78 sq km, between the Bure and the Thurne.". "During Middle Saxon times - roughly the period between the mid-seventh and late ninth centuries - the local population probably increased once again, and more complex forms of social and economic organisation developed. The Broads area became a part of the Anglo-Saxon kingdom of East Anglia, which was roughly coterminous with the modern counties of Norfolk and Suffolk. It is possible that the uplands here were more densely wooded than most parts of Norfolk at this time, in spite of the excellence of much of the local soil. Certainly, many place-names in the area seem to refer to woodland: Acle for example was the ac leah, the oak wood; Fishley, 'the wood of the fisherman'; while both East Ruston and Sco Ruston incorporated the term hris tun, 'the settlement among the brushwood'. 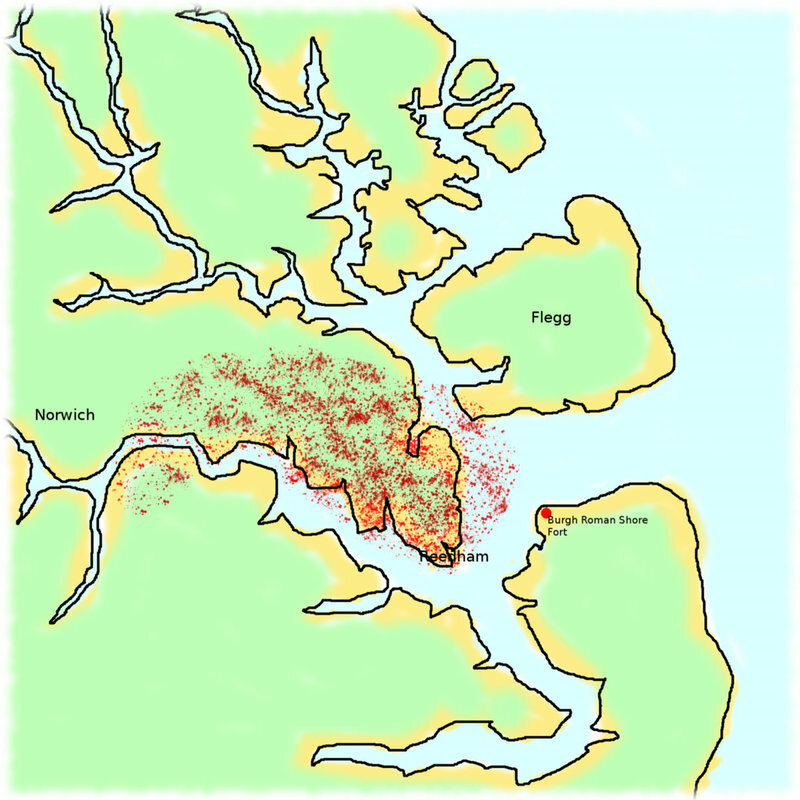 It is possible that, remote from the main centres of power in East Anglia, and exposed to the threat of continued sea-borne raiding, the district was relatively sparsely settled, principally used for grazing. The importance of the latter in the local economy is again suggested by place-names: Horsey was 'the horse island'; Woodbastwick and Bastwick both incorporate the element wic, 'a grazing farm, ranch'; while the names of Winterton and Somerton - the winter settlement and the summer settlement respectively - suggest the practice of transhumance, the seasonal movement of livestock to distant pastures. Extensive areas of seasonal grazing must have been opening up in the form of low-lying fens and marshes as the estuaries here began to silt up. 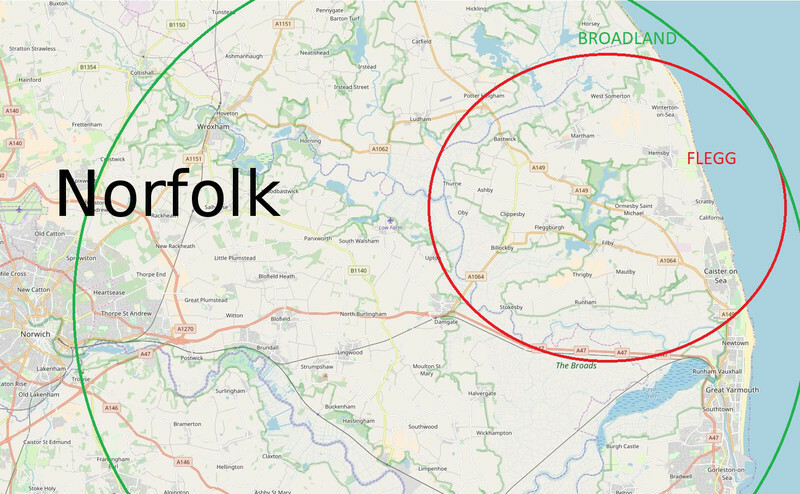 The role of Broadland as an area specialising in grazing and the exploitation of woodland - complementing the arable specialisms of other parts of the East Anglian kingdom - is also perhaps indicated by a particularly noticeable feature of the area at the end of the Saxon period. Domesday book shows that a very large proportion of the population here was classed not as bondmen - as villeins, sokemen or bordars - but as free men, liberi homines. Such individuals were very thick on the ground both in Flegg, and on the uplands bordering the south of Broadland, and the power of manorial lords in these areas was correspondingly circumscribed. There are many views on the nature, and significance of such men: but one interpretation is that they were the descendants of Middle Saxon peasants whose main role had been that of herdsmen or shepherds, and whose obligations to king and nobles were thus less servile or onerous than those of arable producers." In restricted areas there also appears to have been large-scale peasant immigration from Scandinavia. One of these was Broadland. Viking place-names - especially those featuring the suffix -by, 'farm, settlement' - are densely clustered on the island of Flegg (a name itself derived from a Scandinavian word meaning reeds), widespread in Lothingland, and scattered more thinly along the upland margins of the Yare and Waveney." "Whatever the nature (and extent) of Viking settlement in the area, there is no doubt that by the time of the Domesday survey in 1086 the upland parts of Broadland were no longer a sparsely-settled landscape of woodland and pasture. They were now - together with the neighbouring clayland areas to the south and west - one of the most densely settled and intensively farmed regions in the whole of England.". "The region's dense population, and complex social structure, are manifested in another way: in the small sizes of parishes, and thus in the large number of parish churches. Indeed the upland areas of Broadland have one of the highest densities of parish churches in Britain. Many of these (although not the present structures) were already in existence by the time of Domesday: their proliferation reflects not only the comparative wealth of this fertile region, and the need to house large congregations, but also perhaps the confused tenurial structure of the locality. Families of freemen may have been keen to endow churches in order to establish their status: church-building was the mark of the lord, rather than the peasant." "In East Anglia, in contrast [sic to the classic "great open fields" elsewhere in medieval English parishes - PB] medieval agricultural systems were much more flexible and individualistic: seldom were the strips widely scattered across two or three great 'fields' but were instead more closely clustered in the vicinity of the peasant's homestead, and individual farmers had more freedom of choice about what they grew and when. In the west of Norfolk, such freedoms were somewhat limited by the institution of the 'fold course' - the right of the manorial lord to graze sheep across the tenants' land for much of the year. In Broadland however - where the power of manorial lords was more circumscribed - fold courses were rare and tenants enjoyed almost complete freedom over how they organised their cropping, and rights of grazing over others' land were often limited to the period after the harvest." p14. 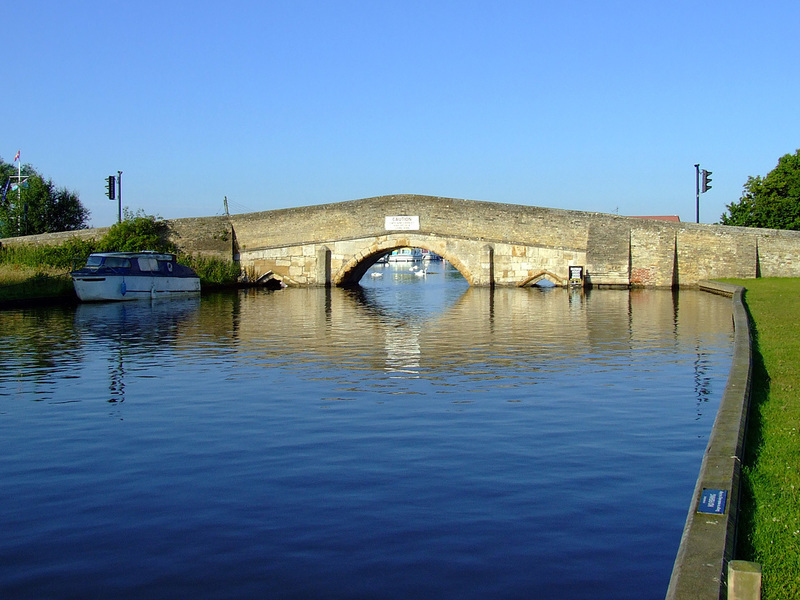 "Until recently the A149 road from North Walsham crossed the river Thurne by the medieval bridge at Potter Heigham"
p 16. "Flegg farmers have always distinguished between the upland and the marsh (The upland in Flegg is all land over five feet above sea level)." p20. "Yarmouth has always been the market town and urban centre for Flegg. In the Middle Ages corn from Flegg fed the town. For centuries Flegg farmers and small-holders have sold their livestock, vegetables and fruit at the Wednesday and Saturday markets." p22. "The Danish settlement of East Anglia began after 880 AD, when, according to the Anglo-Saxon Chronicle, the Danes occupied the land and shared it out. They must have come to Flegg in considerable numbers for they gave names to thirteen out of twenty-two villages in Flegg." p22 "The name Stokesby, which is Saxon in its first element and Danish in its second, is an interesting one. Not only does it suggest the mingling of the two groups, but it may also explain why the Danes found the Muck Fleet valley virtually empty. The Saxon word 'stoc', pronounced with a long 'o', was used to describe an 'outlying pasture near water where cattle are kept for part of the year'. If this is true of Stokesby, then the Danes may well have found only cattle-minders in the valley, with perhaps small and scattered settlements around the heath to the west." p23. "Most of the Danish village names in Flegg incorporate a personal name, such as Orm (Ormesby), Malti (Mautby), or Hrodulfr (Rollesby). Dr Sandred believes that these are the names, not of warrior chiefs, but of free farmers, more interested in acquiring land than pillage and warfare." p24-25. "Danish words have survived in Flegg as they have generally in Norfolk. Holme means an island and is applied to an area of dry ground in the marsh, often a gravel bank. Winterton and Somerton Holmes are sufficiently well drained to be ploughed and contain farms. Medieval field-names include 'gate' for a road, 'wong' for a furlong or collection of strips in the open fields and the 'syk', a marshy strip of land by a stream. These words are still used. Ferrygate and Damgate are roads in Martham, villagers go 'over the wongs' from the church to the hamlet of Cess, or through the 'syk' meadow, marshy ground, which was once a navigable stream, marking the boundary between Martham and Bastwick. One Danish name has vanished. The hamlet of Sco, mentioned in the Domesday survey, lay where Martham, Bastwick, and Rollesby meet around the present Grange Farm (OS TG 437 172), but Sco never became an ecclesiastical or civil parish. The word is Danish, from skogre, a wood, and is appropriate for a settlement at the bottom of Speech Oak Hill." p29-30. "A few words of explanation are needed about the terms used in the extract. 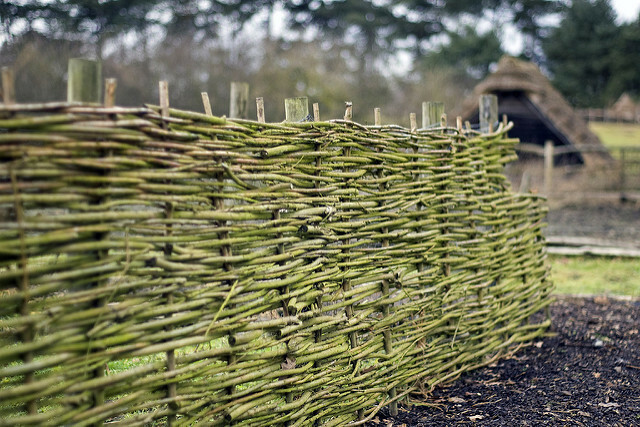 The hide was a Saxon measurement of land, which notionally contained 120 acres. In Norfolk, the Danish word carucate, also 120 acres, was used instead of hide. The carucates and acres recorded are not very accurate measurements but they give a rough idea of the size of a manor dmesne ir a freeman's farm. The demesne was the home farm of a manor and its produce went to the lord of the manor for his use. Villeins and cottars, or bordars as they are called in Norfolk, were attached to the manors and provided much of the labour force on the demesne. Serfs, possibly slaves, were present in small numbers on a few manors. Freemen and sokemen were always regarded as free tenants. The number of ploughs is always recorded on manors and on the freemen's and sokemen's holdings. The word 'plough' includes a team of eight oxen." p31. "The two Flegg Hundreds, along with others in East and South Norfolk, were the most densely populated in the county. The freemen, villeins and other tenants were heads of households with dependant families. I was surprised to see how close the number of Domesday households were to returns from the first Census of 1801. Many readers will have some idea of what life was like in Norfolk two hundred years ago in the days of Nelson, Parson Woodeford and the Agricultural Improvers. It is important to remember that Norfolk was probably as busy a place in the late eleventh century, as it was several hundred years later." "Over two thirds of the inhabitants of Flegg were freemen and sokemen, that is men and women of free status, but it is not always easy to define their position in society. Sokemen are almost always attached to manors and on some manors had specific services to render to their lords. On manors belonging to St Benet's Abbey they were often employed as ploughmen. In theory at least, freemen were free of all feudal control, but most had commended themselves to a powerful lord in order to gain protection. These freemen, in commendations only, as Domesday says, had minimal obligations to their lords. They could sell their land, often without even consulting the lord. They had the right to attend the Hundred Court and to take part in its deliberations. Freemen and sokemen were numerous all over Eastern England, their numbers declining towards the west. Historians have thought that it was a Danish origin or influence which enabled the freemen to maintain their independence from feudal pressures. A more likely cause is now thought to have been the general economic prosperity of eastern England that helped the freemen to withstand the pressures of the feudal lords." p33. "Villeins and bordars account for only a third of the tenants. Whatever their exact legal status, they were certainly under close control of their manors on which they lived and where they provided most of the labour on the demesnes. They had their own farms, but the size of their holdings is nor recorded. A hundred years later the usual villain holding in Martham was about twelve acres, but there were wide variations. Bordars had smaller holdings, perhaps about five acres. Bordars are particularly numerous in west Flegg where the small manors sometimes relied entirely on them for labour. Only twelve serfs are recorded in Flegg." p36. "Corn was not the only valuable commodity produced in Flegg. Both salt production and sheep farming brought in extra income. The spring tides up the river Bure flooded pools in the estuary with salt water that gradually evaporated in the summer sun and wind. The resulting brine was taken to earthenware pans on the marsh edge where the brine was heated until the salt crystallised. At the time of Domesday, Flegg was the centre of salt production in East Norfolk." p53. "In the twelfth century the introduction of windmills gave the landlords other sources of income. 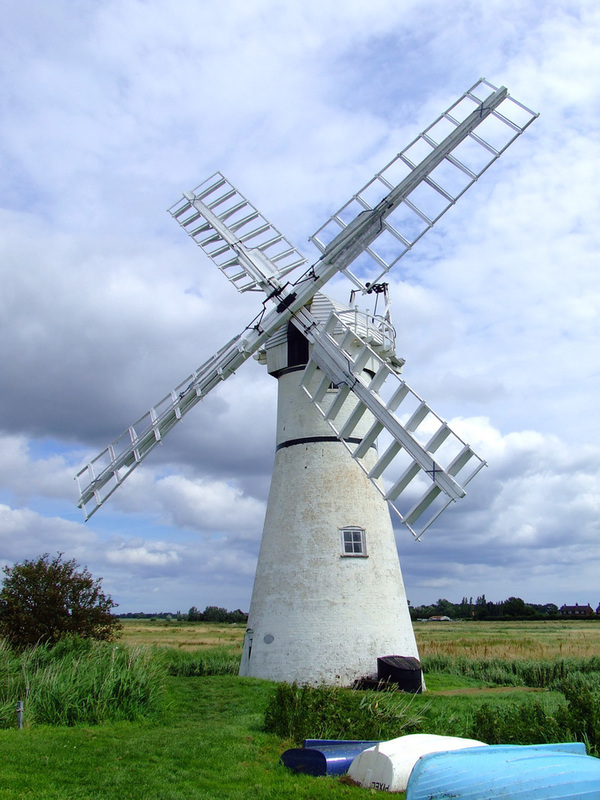 By 1200 windmills at Herringby and Rollesby had been recorded and by 1300 windmills were common in all Flegg villages. At the same time the use of horses for ploughing meant that the lords were less dependent on the ox-drawn ploughs of their freemen and sokemen to cultivate the demesne. By 1245 ploughing was done by horses on the Abbot of St Benet's manor of Ashby and no doubt on most other manors." p91. "At Martham, as was usual in East Norfolk, a tenant's holding was not a block of land, but a collection of strips in the open fields, usually in the fields nearest to the tenant's home, although some holdings were scattered more widely in the village." p138. "The Black Death arrived in Norfolk in the spring of 1349 and spread up the river valleys from Yarmouth. It was particularly severe in South Norfolk, along the Yare and the Bure valleys and on the coast." p139. "The Inquisition Post Mortem taken after the death of Thomas de Essex in 1351 for his manor of Runham states that all the tenants were dead.". p144. "It is surprising that Flemings left the Low Countries to work in England after the Black Death. Flemings were employed in many places in East Norfolk in the 1350s. In 1355 a Fleming was hired to cut and harvest five acres of wheat in Martham for which he was paid 3s. 4d. This separate entry suggests that perhaps he worked away from the other harvesters. The next year a Fleming was employed for eleven days to thresh seven quarters of wheat at 3d. a quarter, which is considerably less than the usual rate of 5d. a quarter. I have found Flemings mentioned at Rollesby, Ashby, and Scottow. St Benet's Abbey employed twelve Flemings for the harvest of 1356. Perhaps these men went round in a gang hiring themselves wherever they were needed. It is difficult to understand why they came across the North Sea to seek farm work. It has been suggested that the Black Death did not claim so many lives in the Low Countries where the standard of living was higher and resistance to the disease greater than in most of Europe." I'm stopping there. I could take it through the Peasant's Rebellion and the Late Medieval. I highly recommend Barbara Cornford's little book. She in particular, has dissected the manorial records of Martham, Norfolk. She successfully brings the Medieval in that manor to life. Not so alien. People were still clearly very much people as we know them. On a personal, genealogical level, I have many, many Broadland ancestors on my mother's side recorded over the past 400 years or so. However, their main cluster area was immediately to the south of Flegg, along the Yare valley in Broadland. But tracing back - some of the lines there had moved down from the general region of Flegg - Moulton St Mary, Acle, South Walsham, Stokesby, Repps-with-Bastwick, Herringby, Rollesby, Ormesby, etc. Therefore on a personal level, I've enjoyed researching this history, as I most likely had many ancestors on Flegg a few centuries earlier, during the Later Medieval at least. I don't have very many photographs taken on Flegg. 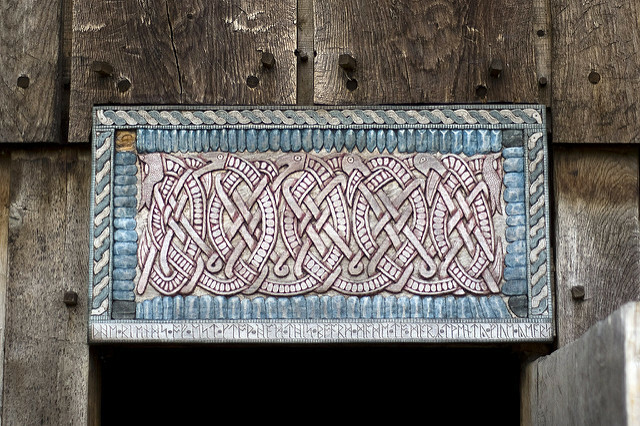 Once I've completed the Wherryman's Way long distance trail, I need to explore the churches and landscape of Flegg. On a Population Genetics Level - 3 points. The 1348 Black Death. It killed a lot of families. At least one third of the population died, in addition to a famine and hard times that preceded the disease for several years before the outbreak. Once again, I find evidence of admixture in East Anglia, from the Low Countries. The long term link across the North Sea to the Lower Rhine Valley. Movement during the 15th Century. As Feudalism gradually collapsed over the 150 years following the Black Death, more and more people started to move around England - away from their ancient manors and parishes. Cornfield noted three brothers from Martham during the 15th Century. One ended up in Ely, Cambridgeshire, another in Halesworth, Suffolk, and the third in London. Should any of the brothers had returned to the manor they would have owed money to their lord. They didn't, people were moving around by then. Flegg doesn't yet have a great landscape history of the Late Prehistoric. It does have an importance during the Romano-British, with the Fort of Caister etc. 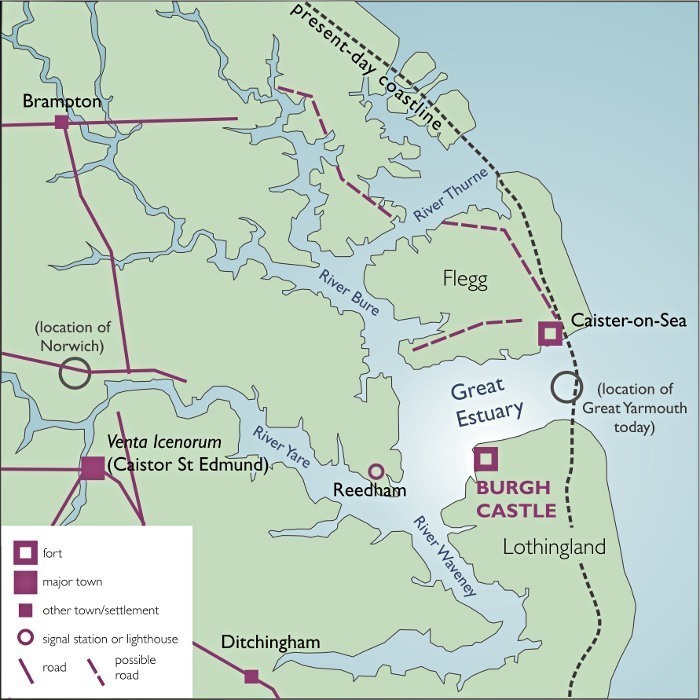 The current story picks up during the Middle Saxon, where we currently get the impression that this last wild landscape of East Anglia was picked up - vulnerable to sea raiders. 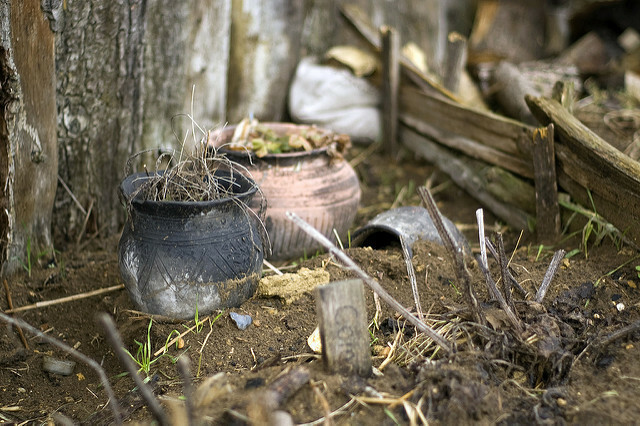 It's natural resources at first exploited for woodland materials, then more so as grazing land and pasture. It's almost bizarre concentration of Danish place-names and words from the Late Saxon period. I cannot think other than that an Old Danish-speaking people - at the very least, a significant immigration, settled here, and finally founded villages and farmsteads with names. It's not the traditional story of raiding, marauding Vikings, but of the immigration of farmers. By Domesday it's full of people and production. A centre, an agrarian hub. The imposition of feudal pressure by Norman lords being resisted for centuries by local freemen farmers. They say that Norfolk does different. Flegg certainly did, with it's proto-capitalism and relatively (to the West Midlands for example) free labour markets.